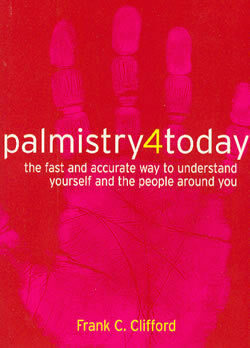 In Palmistry 4 Today Frank Clifford lets us take up the position of a “palm detective” and takes us through how to gain a first impression of the palm and his special 4-step guide for fast assessment. The book also includes timing techniques and special focus areas, such as Love, Health and Career. There are copious samples of palm prints and finger details, clearly illustrating features that are only lightly touched on or discussed in other texts. Frank Clifford, the book’s author first began studying palm reading after receiving a “doomed”, fated prediction from a lady who read hands. Fortunately her prediction that he would meet a partner who would then promptly die did not come true! Frank’s passion for the subject of palmistry nevertheless grew and he learnt intensively through running marathon charity palm-reading sessions and lecturing on the subject to university colleagues. He was clearly on the right path as this round of early activity began a pattern that he built on securely over the next twelve years through reading, writing and speaking on astrology and palmistry. Frank has a strong, international practice and as well as a highly experienced teacher and speaker in esoteric subjects, runs the London School of Astrology (LSA) where Palmistry is just one of several available courses of tuition. Palmistry 4 Today is now a classic. The book first published in 2002, immediately attracted much media interest including the Guardian Careers section and Channel 5’s Open House. Frank Clifford has an interest in empowering those he comes into contact with and his appearance on Gloria Hunniford’s show gave a glimpse of his warm teaching style and wisdom, helping others to rapidly grasp the significance of the hand’s shape and markings. Part of the appeal of Palmistry, Frank explains, is that “it is so instant - and there’s a lot of magic and mystery about the palm”. In the book he endeavours to make the subject clearly and quickly accessible, including practical ‘tips for budding palmists’. This includes details of materials used for palm prints, improvising from the kitchen as far as possible! One of the most important messages from palmistry, he says, is that “the palm shows what level you are operating on; how you are using or distorting your talents and needs”. It is this kind of message that emphasises the books relevance to modern life and marks it out as different from many of the older texts on the subject. All in all, Palmistry 4 Today is a must-have for the budding palm reader, with a chance to share the knowledge, wisdom and insights from an expert with a long-standing client practice. Details of courses at the LSA can be found at: http://www.londonschoolofastrology.co.uk/ or call 0700 233 4455.